The cricket-loving population is a heterogenous mix of Indian, African, European and native peoples, roughly in that order of volume. However, like much of the English-speaking Caribbean, Guyana also has a tiny, but significant, Cantonese population — a legacy of the same forces at work during the days of the British Empire that also relocated large numbers of Tamil and Gujurati Indians there to work as indentured plantation workers. Numerically insignificant, the lasting impact of these Hong Kong Chinese has been on local commerce and the cementing of certain southern Chinese dishes, the most popular of which is chow mein, in the diverse local cuisine. Of course, the chow mein enjoyed in Guyana bears only a certain resemblance to that eaten in Canton and other parts of China, I am sure. Indeed, Chinese food all over the western world has been amended to suit local tastes and ingredients, and so it is in Guyana where access to even basic Chinese staples like soy sauce was not always possible. 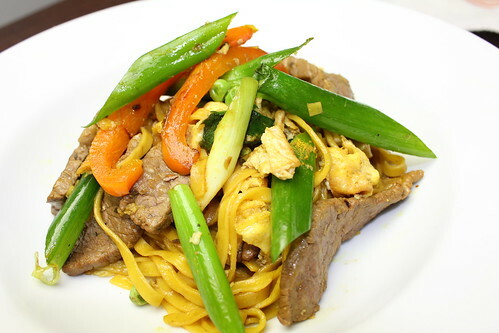 Similarly, the inevitable mixing between local gastronomic cultures, namely the addition of a sly pinch of West Indian curry powder that seems to find its way into all kinds of unlikely dishes across the Caribbean, is what makes this chow mein recipe inherently Guyanese, not to mention the bright yellow noodles, made with soft wheat and plenty of food coloring. Other local variations on the original include the addition of yellow squash and green beans. We had never eaten this dish before, but we’d experienced it up-close at several West Indian parades both in New York City and London, where it was served in trays with plastic forks as street food, and where the searing perfume of garlic and curry managed to cut right through the ripe fragrance of perspiring dancers. 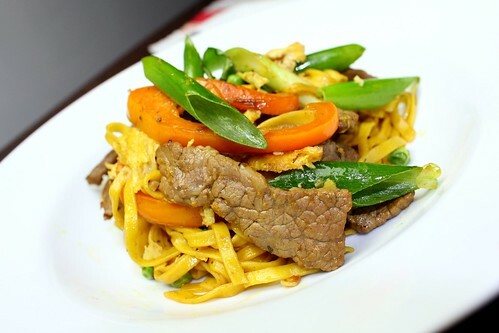 In truth, the flavors, with the combination of curry and soy sauce, aren’t that dissimilar to the popular Singapore noodles found throughout South-East Asia and at many British Chinese restaurants, and they should feel relatively familiar to anyone who has eaten both Chinese and Indian take-out food before. So, while you (or we) may never get to visit exotic Guyana and witness first hand either it’s beautiful landscape or delicious cuisine, you should try making this dish. It only takes about twenty minutes to prepare and will satisfy a host of your ethnic food cravings. For more authentic Caribbean recipes, check out Cynthia at Tastes Like Home. 2 tablespoons peanut or vegetable oil. Remove from wok and reserve. Add remaining oil, and after 5 seconds, add bell peppers. Cook on high heat stirring regularly for 2 minutes until they start to wilt a little. Cook meat until done before adding soy sauce, sprinkling on curry powder and 1 tablespoon of water mixed with corn starch. Stir well before quickly adding reserved noodles, peas and spring onions. Continue to stir until all noodles are well coated with sauce. That would be my type of dish, I love mixing cultures. I love the places where cultures converge and share their cuisines. It’s always so interesting to see how the countries influence one another and (sometimes unknowingly) bond over common ingredients. This dish appeals to me in so many ways –not the least of which is that I’m a sucker for any type of Asian noodle dish. You could put what I knew about Guyana in a thimble and still have room. Interesting place and love the fusion. There is something wonderful about curry and Chinese food… they are awfully good together… now what about those noodles??? WHere do you get them??? I love curry with Chinese-type food (totes Malaysian, yo), and I love those yellow noodles. They remind me of all the Maggi products I saw everywhere in Fiji. Speaking of which, I feel very strongly that there should be Maggi sauce in the recipe – the African influence almost insists. I have no idea if they even use Maggi sauce in Guyana, but it does seem like one more place where Nestlé would have a stronghold. funny you should mention tallarines, I was just thinking about them and about to start the prep for a post about them. Love to get my hands on those noodles. Thanks for a most interesting post. Especially like the addition of curry to the stir-fry. Wishing your family a wonderful Easter. Stumbling upon this today is excellent because we’re going to try a hand at Guyanese cuisine for our next Ethnic Exploration feature. You guys have given some really interesting tidbits that were previously unknown! Really interesting post. I thoroughly enjoyed your post over at CSM on this Guyanese favourite. Though we do not add curry to the chowmein, I like the idea. Must try sometime. Thanks for promoting the cuisine of my birth land. @Cynthia – thanks for your comment. Yours was one of several sites we visited in preparing this post, and we’ve now added a link to you into the post. Thanks also for your correction – something we take seriously and respectfully. In the recipe we do acknowledge our addition of curry isn’t strictly traditional, but it sure is delicious! greetings from Suriname, where you find a different fusion than in Guyana. thanks for trying to do a spotlight on Guyanese culture and food. I am Guyanese, so I know that half the information you wrote here is wrong. 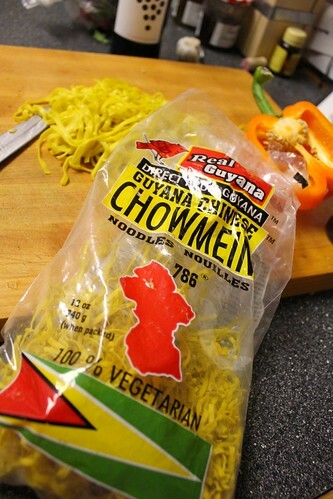 CURRY IS NOT USED IN GUYANESE CHOW MEIN…and neither is a pinch dropped into most West Indian (English Caribbean) dishes. @Paul: thanks for dropping by, barely reading the post and being fairly offensive. I’m happy you’re so proud of your country. I’m English but that doesn’t mean I have the last word over everything English. As it happens, we did research this post extensively and can point to those sources if you’d like to nit pick with them. We say in the post that curry is a non-traditional ingredient in Guyanese chow mein, and I contest that curry powder does find its way into a number of West Indian dishes, especially those of Trinidad (the 2nd largest nation, by population, in the Anglophone Caribbean). And what information about the ethnic make up of Guyana is wrong? Check this out for more details. Also check that link for information about the Chinese Guyanese population, which, we said was predominantly Cantonese, not Hong Kong, though most of them arrived in Guyana via Hong Kong as it was and remains the main port on that part of the South China Sea. @Catherine: thanks for your comment! We’re delighted it came out well. It’s so easy and delicious we should eat it more often than we do! Feel free to direct anyone interested in the recipe over to these here web pages. Paul is right. Thoughthis recipe might be tasty, it is incorrect. Please attain recipes of guyana from the souce. Guyana. Also those wanting the noodles, they are available all over Queens New York stores particularly in richmond hill and jamaica queens area. @Rebecca: thanks for stopping by. I think you mean “obtain” not attain, but you’re entirely welcome to your opinion. That said, your point is a bit like saying only obtain tea from China because that’s where it’s from. Since I’m not likely to get to China or Guyana any time soon, but I might want to make a cup of tea or this dish in the meantime, I’ll continue calling it Guyanese chow mein and adding West Indian curry powder if I feel like it. You definitely have a nasty attitude. That is correct. And all of your information is not correct but thank you for the effort. Just because a source states information, does not necessarily make is so. I came across this by chance and enjoyed the article up until I saw your character. Will I be attacked also? You have wonderful day. For anyone else who cares, I usually have seen this dish with sliced boiled eggs. One last thing, you said served with plastic forks. It just seems odd and out of place. Like an insult. Did you want your silverware with your street food? They way you place your words might come off as if you where speaking down to others or a culture as a whole. My friend, you seem to know all about that. @ Shelly: Thanks for stopping by and your comment. I’m sorry you don’t like our attitude, that’s too bad. I would suggest you read more of our posts before you come to that conclusion because we are by no means nasty people. Nonetheless, since this is our site, we can basically say what we like. I have not seen this dish served with boiled eggs before, but it seems to be the kind of dish that can be added to at will. And, there were plastic forks available when we first ate Guyanese chow mein, so that’s how we told it. We made no suggestion whatsoever that there is anything wrong with plastic forks nor that we were attempting to demean anyone or any culture, quite the opposite, in fact. The world is an extremely diverse place with so many wonderful things to eat, and that’s what we try to showcase on our site. I am looking for a vegetarian Guyanese recipe, know any? @Dave: we ate Guyanese phulouri and curried vegetable roti at a Guyanese restaurant – Le Jardin du Cari (5554 Blvd Saint-Laurent) in Montreal – recently. We don’t have a recipe, but I bet you could find one easily enough. Jonny, I appreciate yours and Amy’s site tremendously. I find all of your food to be flavor packed and fun to make; your background stories provide great imagery for me. My mom is from Guyana and my dad is from Trinidad. My siblings and I grew up on Caribbean cuisine especially dishes like this. Our cuisine by definition is very open to the cook’s interpretation as people have always cooked with whatever ingredients they had on hand. In the states, some people will use nothing more than a bag of frozen mixed veggies because that’s what’s cheap and quick. In lieu of regular soy sauce, Mushroom Soy Sauce is a BIG ingredient in Chinese-Caribbean cooking, it’s much more complex and flavorful than regular soy sauce. We use it all time time in chow mein/ fried rice and you can find it in any Chinese market. You mentioned long beans which are also spot on—called Chinese long bean (bora in Guyana or bodi in Trinidad) is used often as well and gives great texture. Finally, raw cabbage sliced super fine (a mandolin would be great) and thick sliced cucumber are traditionally served on top. The residual heat of the noodles, soften them up perfectly. Thanks for all the great recipes, keep cooking! @Christina: thank you so much for the lovely comment! Not just was it great to hear something both positive and educational from someone who knows, rather than some of the nastier comments above, but we were delighted that you mentioned the use of a variety of ingredients in the dish. We ate it at a Guyanese restaurant in Montreal last summer with both a pinch of curry, and a side of stewed pumpkin, the latter of which we’d never seen or been told about before. We did see the cucumber though – a really nice crunchy touch. Thanks also for the heads-up on Mushroom Soy Sauce! We’ve seen it a few times in the Caribbean isle at the supermarket but never knew what to do with it! If you live in London you can buy the Guyanese noodles and lots of other Guyanese products at a stall in Dalston market. @Bonita: thanks for the handy tip!